Solid Wood – is solid wood all the way through. “Solid wood” should represent whole, uniform lumber, not a fabrication or wood composite, like particle board, MDF or even plywood. Commonly used for cabinet fronts, counters, moulding, corbels and edges. Medium density fiberboard (MDF) – a engineered wood product that’s made up of wood fibers. The fibers are combined with an adhesive under pressure and formed into boards and panels. MDF has a finer texture than particle board and is denser and heavier than particle board. It’s used in cabinet doors, shelves and cabinet boxes. Solid wood has many benefits and is available in a variety of species. Since solid wood boards typically expand and contract both horizontally and vertically when temperatures and humidity rise and fall, cabinets, doors and panels made from solid wood require a high level of care and maintenance. When solid wood is installed it is essential to maintain proper humidity levels in the home, humidity levels vary depending on where you live, however the general recommendation is 35-40%. Medium density fiberboard (MDF) is a high grade, composite material that performs better then solid wood in many areas. It is made from recycled wood fibers and resin, is machine dried and pressed to produce dense, stable sheets. MDF is more stable then solid wood and stands up better to changes in heat and humidity. In the construction of painted cabinet doors, MDF outperforms solid wood. The conventional frame and panel method (5-piece construction) building solid wood doors involves connecting five separate pieces. Four frame pieces and a center panel cut slightly smaller than the frame to allow for expansion and contraction. MDF because it is made of wood fibers in sheets, can be milled by CNC (computer controlled machinery) in one-piece frames with the center cut out for a recessed panel. Because of its density, MDF does not move independently from the inserted panel and does not need to float like the conventional five-piece solid wood door. Since the mdf panel does not float within the frame, hairline cracks do not form along the edges of the panel or at the style and rail joinery. MDF will expand and contract but with this 2-piece construction method the doors move as a unit and not as individual pieces of wood, therefore the paint does not crack or peel at the joints. MDF does not have any visible wood grain and knots which is an added benefit in a painted finish. MDF is commonly offered in a variety of painted lacquer finishes including, 20,40 60 degree sheens, glaze finishes and hi-gloss polyurethanes. Plywood is a sheet material manufactured from thin layers or “plies” of wood veneer that are glued together with adjacent layers having their wood grain rotated up to 90 degrees to one another. Plywood is used for shelving, doors and cabinet boxes. 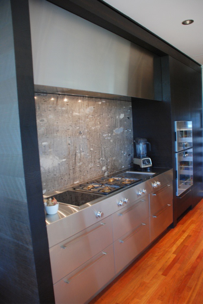 Stainless steel/metal – Stainless steel in kitchens is generally used for countertops, hoods, reveals, for the underside of stoves, and fronts. There are different grades and surface finishes of stainless steel to suit the environment the alloy must endure. Stainless steel is used where both the properties of steel and corrosion resistance are required, but is also used for it industrial look, durability and versatility. It doesn’t chip, bend, or crack easily (though it does scratch), and it stays shiny over years of use. Stainless steel is a metal alloy with about 10-11% chromium. When exposed to air, the chromium in the metal forms a film of chromium oxide over the surface. This film is passive and non-toxic, and most importantly, it prevents the steel from rusting by shielding it from air and moisture. Even if the metal gets scratched, the chromium oxide reforms seamlessly. This gives us all the excellent properties of stainless steel without the worry of rust. It’s also non-reactive, unlike aluminum and iron, so we can use it for preparing and cooking acidic foods. Plastic laminate – Laminate is a synthetic coating glued to the cabinet box and/or doors. Usually craft paper and resin fused with heat, it can be manufactured in a wide variety of colors, patterns and textures, including wood grain. A high-pressure laminate (HPL) is fused at a higher temperature and pressure, and lasts longer, than a low-pressure laminate (LPL). When selecting a laminate cabinet, you should ask about the substrate – the cabinet box under the laminate coating. Is it plywood, particle board or fiberboard? A cabinet box made from a lower-grade particle board will not hold up well. Laminate cabinets are easy to clean. Laminate is difficult to repair if it gets damaged, replacement is usually recommended. Melamine – Melamine starts with a compressed wood particle core. It is then covered with a resin and paper finish that can be manufactured to various styles and colours. Melamine cabinets are resistant to many of the common issues presented in a kitchen, whether it be excessive moisture, heat or stains. The reason why melamine can resist these external elements is because of its tough outer coating. This coating is also easy to clean. Melamine is a synthetic material and is produced with an almost endless number of finishes. You can select from faux wood grains in various shades or solid colours. Melamine offers a consistent finish since it is manufactured in a controlled setting. And is offered at a much lower price point. Melamine can chip and is susceptible to water damage. It is commonly used for cabinet interiors and can also be used as cabinet fronts and parts. Thermofoil, UV panels & Acrylic panel – is a surface finish applied to cabinets by multiple manufacturers. It is a plastic material which is thermoformed to the profile of an underlying engineered wood core such as medium-density fiberboard. Thermafoil is not heat-resistant, so ensuring it is not installed too close to an oven or other heating source, such as the laminate peeling away from the core and discoloring . To protect the cabinetry, heat shields can be installed (which are essentially just metal strips) between the heat source and the cabinets, which will handle this issue. High gloss finishes entered the realm of kitchen cabinetry several years ago in Europe and since then, North America has caught on to the popularity of the look, and high-gloss is becoming more prominent in everything from kitchens and baths, to closets and furniture. Materials technology has also advanced to bring high gloss to market across all price points. High gloss can create emphatic contrast, particularly when used with surfaces that reflect nature, like the dark, textured wood grains that are also gaining in popularity. The use of high gloss for accent colors can really pop and a white high gloss kitchen gives a sleek, clean, modern feel. The classic approach to high gloss is to simultaneously apply paint and a high gloss lacquer to wood or mdf. This is best when it is professionally applied to ensure a uniform sheen. Lacquer is a good material for high-gloss finishes because it’s easy to work with and can be sanded flat and polished to a high gloss. The problem with high-gloss finishes is that with crisp reflections surface defects are very obvious. The finishing process is highly labor intensive which can makes it more expensive than other options. Other options for high gloss cabinets are thermofoil, acrylic, laminate and UV panels. This relatively new material is increasing in popularity due to its contemporary look and durability. These options waterproof, will not warp or yellow in the sun. Traditional laminates, both HPL and TFM, offer high gloss finishes. There are several ways that this is achieved, including specialty overlays and technologies that impart textures (including press plates, release papers and belts). Technical HotCoating is another method that is beginning to make its way into the North American laminates market. For this process PUR is heated and applied in an even coat directly over melamine. In all cases the panel is sealed. Laminates are typically scratch and water resistant, characteristics that are increased with HotCoating.